Free full Cancellation of the whole group until 4 weeks prior arrival. 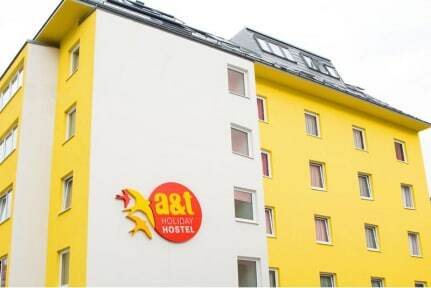 A&T Holiday Hostel is one of the most modern youth hostels in Vienna with a fantastic location and excellent public transport links. This means fast access to the city's historical sites. St Stephen's cathedral, for example, is just only 11 minutes from the hostel. The building has been newly constructed and provides ample space with its large rooms which contain between two and a maximum of six beds. Two elevators mean you can access even the top floor quickly and easily and all rooms are equipped with WC, shower, washbasin, reading lamps and lockers. If you have any valuables which are especially precious, these can be kept in the safe at reception. By the way, we also have an entire floor reserved just for women! There is free wireless Internet on the ground floor and in the basement: lobby, breakfast room and bar providing speedy access for all those with a smartphone or laptop and computers with Internet connection are also available in the lobby. Our Western-style bar, which takes you back to the days of the Wild West is the perfect place to either celebrate or unwind and is open every evening. The reception is open 24/7 and is manned by both our family business staff as well as our young, competent team who are there to provide you with help and information around the clock. You can also enjoy a game of pool or table football and to keep hunger at bay or quench your thirst you will find drinks, coffee and snack vending machines next to the dining room. We even have coin-operated washing machines for you to do your laundry.